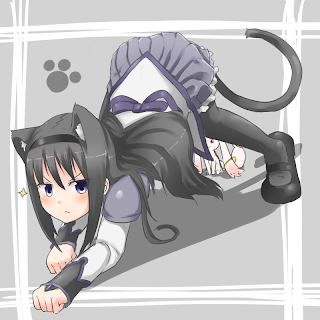 Homu Homu art is always relevant. Well, actually I do know, but that's just silly semantics. I'll be leaving for a vacation to Beijing, where Rho and Aaro are, and then we'll all head to Hong Kong. I know my posts lately have been a bit more delayed than usual (some IRL stuff + slow editing from Aaro), but now it will probably be even more delayed. I'll try to keep my core favourites (Steins;Gate, [C], and probably Dog Days) to post about within 24 hours. There's no guarantee, though. I'll also probably have some random posts of my site-seeing, but I'll see about that. On a side note, I hate all of you for picking Rho's totally crazy out-of-border thing. This is outrageous.